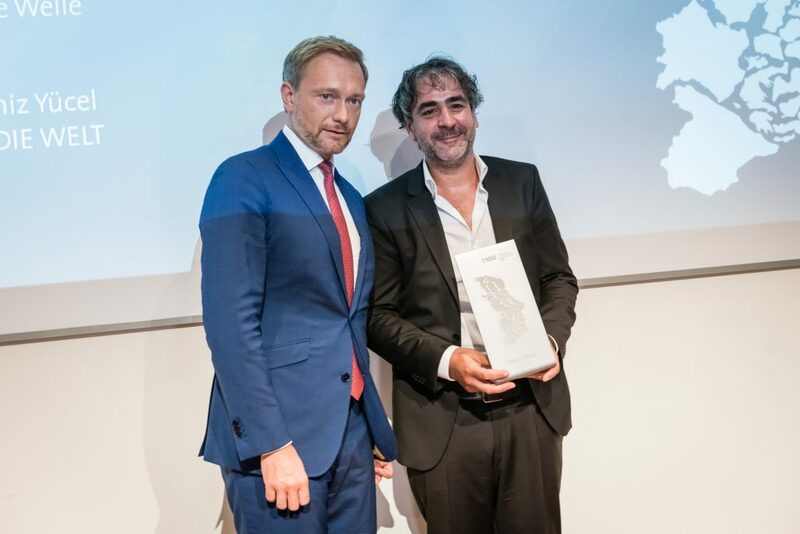 As Turkey correspondent for the WELTN24 Group, Deniz Yücel attracted the displeasure of the Erdogan regime with his uncomfortable reporting, inter alia, on the Kurdish conflict and corruption in government circles. He was targeted by the judicial authorities at the end of 2016 after reporting in DIE WELT about a hacker attack on energy minister and Erdogan son-in-law Berat Albayrak. The e-mails, which included links between the Turkish government and the terrorist militia “Islamic State” (IS), were leaked to opposition media. Yücel was subsequently arrested and remanded in custody for alleged “terrorist propaganda”. But even under the pressure of his one-year imprisonment, Yücel was not banned from thinking or speaking. The award is also a reminder of all those who have yet to be released. After working as a producer and financial director for several TV and radio shows, Russian journalist and media manager Natalia Sindeeva established Russia’s only independent TV station in 2010, Doshd TV (Rain TV). In contrast to a majority of media outlets, with their close ties to the Russian government, the station is a platform for those who might be critical of the government and its policies. In recent years, Sindeeva and her staff have come under increasing pressure.No reason to give up says Natalia Sindeeva, but rather further motivation to continue with what she herself calls her “Optimistic Channel”. Since the publication of his first book, “Gomorrah: Italy’s Other Mafia”, Roberto Saviano and his family have been threatened by the mafia and have to live a life underground, protected by police and bodyguards. However, he continues to write books and articles about the Mafia and its enmeshments in politics and society. His commitment, his courage, and the restrictions he has to suffer from for years, deserve highest and undivided respect. The M100 Media Award shows him and all those who risk life and limb to speak the uncomfortable truth that their work is not in vain. The ordeal of Charlie Hebdo is of epochal significance. The free world must show solidarity for the victims. Freedom of speech and freedom of press is fundamental to every democracy and must be defended under all circumstances. Klitschko is honoured for his outstanding representation of all the democratic movements in Ukraine and for his courage and persistence in raising awareness worldwide of the progress of the Maidan demonstrations. YanukovychLeaks is honoured for its outstanding achievement in rescuing, systematising, analysing and publishing the vast numbers of documents of Ukraine`s former president and in making the corruption of his reign transparent. Erdem Gündüz is honoured for his brave and courageous protests to uphold human rights and freedom of opinion. His performance title “The Standing Man” has made him an icon of peaceful resistance and inspired thousands of followers around the world. Mario Draghi is honoured for of his commitment to solving the global economic and financial crisis within the mandate of the European Central Bank and to maintaining price stability in the euro area and the European Central Bank’s independence as well as for his contribution to a more stable institutional framework for Economic and Monetary Union in Europe. Michael Anti is honoured for his brave, unwavering and exemplary advocacy on behalf of the freedom of the press and freedom of opinion and for his courageous battle against censorship and corruption. Lord Weidenfeld is honoured for his significant life’s work devoted to bridge-building among cultures and religions, the promotion of dialogue among peoples and a unvarying defence of freedom. In recognition of his indomitable commitment for freedom of speech and opinion. He is honored for his courage to stand by these democratic values and defend them, notwithstanding threats of threats of violence and death. In recognition for his achievements in promoting an understanding amongst the nations of the world, his assiduous commitment to the struggle for justice and freedom and for his essential role in overcoming German and European separation. Ingrid Betancourt has gained world-wide recognition as a freedom fighter dedicated to human rights and the abolition of dictatorship. She suffered from several years of imprisonment and torture as a captive of guerrilla terrorist groups in her native country, Columbia. She had been released only a few weeks before she got the Media Award and reemerged undaunted and determined to pursue her mission with renewed vigour and to maintain her campaign not just for Columbia but also in the world-wide fight against terrorism and arbitrary government. Her message and her example has been as important to Europe as to the whole democratic world. In recognition of his own personal services to the cause of freedom and human relief and especially the struggle against poverty and disease in Africa. Thanks to his work he has sensitised the media in Europe to the global suffering of mankind. As an European, he has shown that Europe is aware of its responsibility towards the humanitarian suffering in the world. In his role as UN Special Representative in Kosovo, he rendered outstanding services towards re-establishing peace in the Balkans.